If you’re a film aficionado like me, but have trouble remembering actor names and movie titles, IMDB’s universal iOS app is probably close to your heart (and your Home screen). On Wednesday, the company beefed up its already impressive application further, integrating IMDB’s Watchlist in addition to instant search, AirPlay support for trailers, more showtimes and movie ticket purchasing, and production notes and agent client lists for IMDB Pro subscribers. The updated iPhone, iPod touch, and iPad app incorporates IMDB.com’s new Watchlist feature, which allows users to create a customizable list of films they’re interested in seeing. If the film is available from Amazon Instant Video or Hulu, users can visit the partner Website to watch it. On iOS devices, users can create and add to this list, though they can’t access video from content providers as of yet. If the film you’d like to see is currently in theaters, you can browse location-aware showtimes, and if you’re in the U.S., UK, Canada, or Spain, you can even purchase tickets on your device, thanks to a partnership with Cinema-Source and MovieTickets.com. You can also now preview trailers on your device or send them to your Apple TV for big-screen viewing via AirPlay. Looking for an older film or for information on a celebrity? IMDB’s search function has been improved as well: The company has taken a page from Google’s playbook and implemented instant results as you type. Finally, IMDB Pro users can access even more data from their iOS device: In addition to contact details and representation lists, Pro subscribers can now read production notes and scan an agent’s client database. 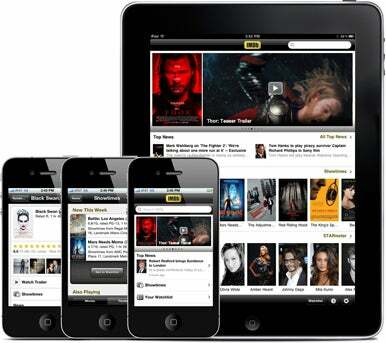 IMDB is available for free from the App Store, and requires an iPhone, iPod touch, or iPad running iOS 3.0 or later (iOS 4.3 for AirPlay support).